It's now easier to collaborate with your colleagues using saved queries with TeamSQL. Save, organize, and share your Oracle, MySQL, Microsoft SQL Server, PostgreSQL, AWS Redshift, Redis, BigQuery, Amazon Aurora, MariaDB or CitusData queries using your private cloud storage. Saving your queries in the cloud storage area makes it easy to collaborate with your colleagues using TeamSQL on your business. Your colleagues don’t need to rewrite the query; executing the shared query returns the same result. Easily share your SQL queries and folders with a single person or a group of people; the choice is up to you. Pin your frequently used queries in the Favorites section for easy access. Give your folders different colors to easily organize them. Select multiple folders or queries to take bulk actions like moving or deleting. Preview function offers a fast preview of your queries without opening the file. With Query Search Bar, you can search all your saved and shared queries and their indexes. Easily find the SQL query you search for. 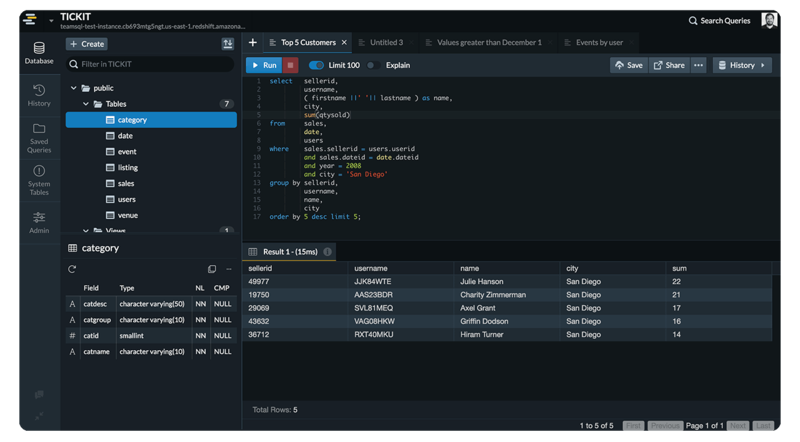 TeamSQL only stores your queries; TeamSQL never stores the results of your queries in the cloud! Please check our Security Page to learn more about security at TeamSQL.